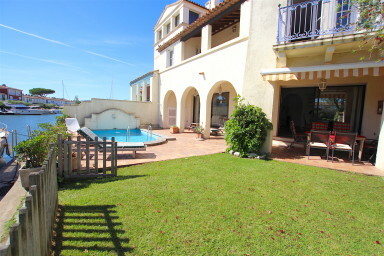 A villa with a pool and a very big mooring in Port Grimaud. 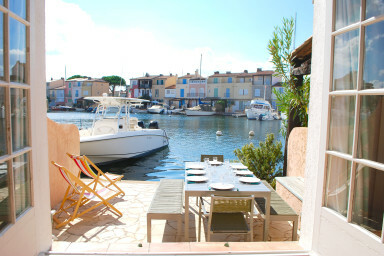 A little haven of peace in Port Grimaud! 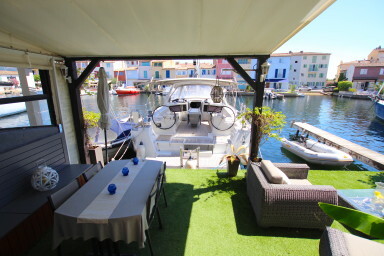 The sun, a terrace and the boat in front of your house: welcome to Port Grimaud! Port Grimaud is an adorable and special lakeside town, with nearly 2,000 marinas and well-sheltered at the bottom of the gulf of Saint Tropez, which unravels across one tenth of a nautical mile. Surrounded by the salty scent of the ocean, Port Grimaud is a door that opens directly onto the great blue, space, and escape. Make no mistake about it: the well-named “Provencal Venice” is a gift for the blessed souls who lay their eyes upon it, an offering worthy of the most beautiful maritime artwork. It is the accent of the Mediterranean that sings in your ear, its scents that sharpen your emotions and titillate the slightest sensations. But Port Grimaud is also a unique architectural ensemble, which received the label Patrimoine du XXe siècle (Heritage of the XXth century) in 2002. The city was imagined and built by the Alsatian architect François Spoerry starting in 1966. This architect was inspired by the heritage of the Mediterranean to the way of life in Provence and the most recent and modern methods of construction. Each house has a particular character. No one house resembles another, and can even be very distinct, differing in terms of location and size of moorings. 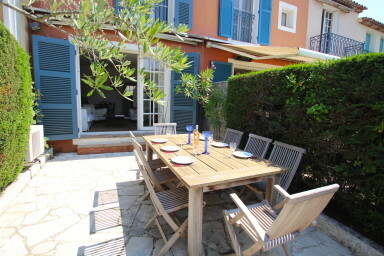 Their location and the view they offer onto the bay of Saint Tropez brings a personal touch to each owner. Although Port Grimaud now looks like an old Provencal village, but with an excellent infrastructure, it has become one of the most beautiful and coveted real estate projects in the world. The construction on Port Grimaud is exceptional, with its some 2,400 dwellings, stretching over 75 hectares and arranged in three districts, each managed in complete autonomy. 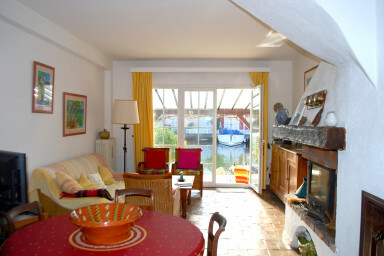 Almost all the houses in Port Grimaud have their own moorings that overlook the façade. These marinas are therefore perfectly integrated into their environment. There is not the moorings with the anchored boats, and then further away the dwellings, and even further away the commercial district. 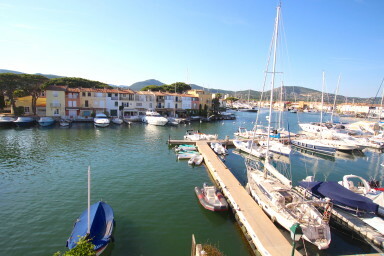 Rather, here, everything is integrated: the moorings are located either directly in front of the houses or within the vicinity, and the shops are quickly and easily accessible, regardless of where in Port Grimaud you are staying. 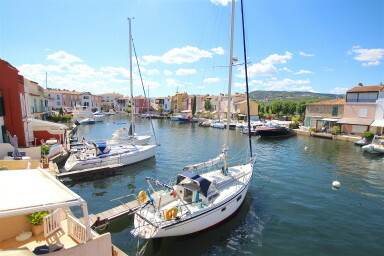 One of the great advantages of Port Grimaud for boaters is that it offers all the services typical of a modern harbor. 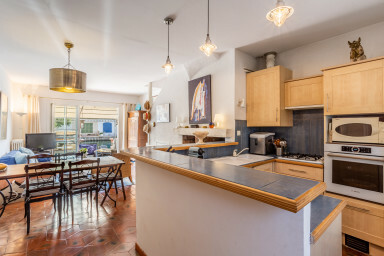 Everything has been designed, thought of, taken care of; you just have to choose one of the many properties currently on the market… via our agency, Boutemy Immobilier. 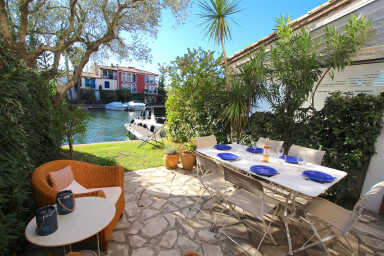 In Port Grimaud, the various types of houses that we can show you all bear the names of sweet Provence. Here, we are not talking about villas, but fisherman's houses for example. But be assured, we will introduce you to the local specialities, because if you imagine that a fisherman's house is a modest cottage, it is nothing like it. 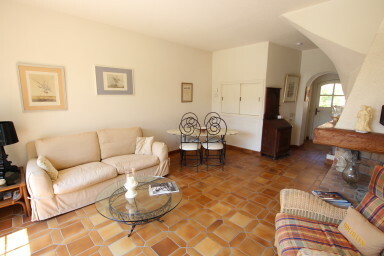 We therefore encourage you to read the article that we have dedicated to the different types of Port Grimaud housing. This will help you learn more these beautiful houses and villas that we call Balandrines (60 to 69 m2), Hunières (61 to 65 m2), Cassines (70 to 75 m2), Ostales (75 to 82 m2), fishing houses (77 to 97 m2), Portales (90 to 99 m2), Borderives (99 to 103 m2). (Note : these sizes are estimates only as we have seen slight variations in reality). François Spoerry was a genius: he hada dream to create a lovely provencal village where all the houses appear unique while they have been built from around a dozen different plans only. A house with mooring ? 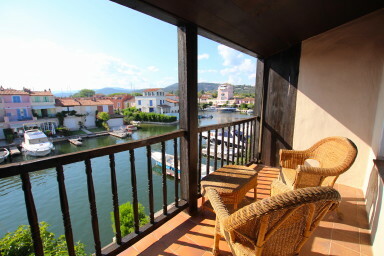 While Port Grimaud attracts many holiday makers who love returning to the luxury of the Côte d’Azur and the charm of Provence, it was built, above all for lovers of the sea. In fact, François Spoerry, its founding architect that we have mentioned above would had dreamed of being a fisherman and realized his dream here : he built a village that allows the residents to moor their boats directly in front of their homes. And this privilege is not reserved only to the elite few as out of around 2,500 properties, there are close to 2,000 mooring berths, some at the port, and others situated right in front of the owners’ houses. 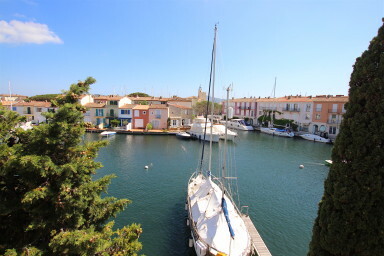 So, when you want to buy a house in Port Grimaud, one of the first questions to ask is " Do you have a boat or will you be renting one for the holidays? If so, “what size mooring do you need?" And it is according to these criteria that you can refine your choice of house that you wish to buy. This is why we give you the option to filter houses according to the size of their mooring (> 12 meters, from 12 to 14 meters and > 14 meters) on our real estate website, . Marion is a business school graduate and is the daughter of Jacques and Chantal Boutemy, the founders of the agency 20 years ago. 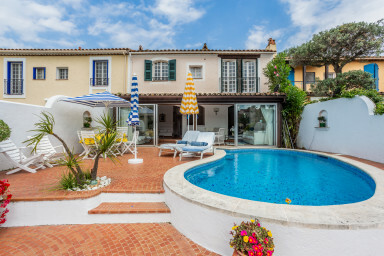 Not only is she a wise businesswoman, attentive to her clients and extremely active in finding properties for them, but she is also and above all an eternal lover of the Gulf of Saint-Tropez and Port Grimaud in particular. 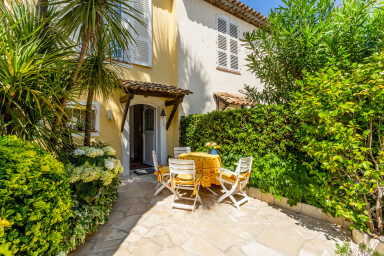 To organize a visit of a house advertised on our site, we encourage you to make contact with Marion at 04 94 56 56 58 or you can meet with us at the agency which is located at 32 place des Artisans in Port Grimaud. 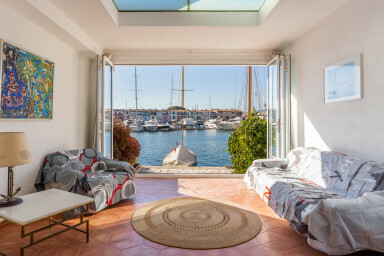 A multilingual and ergonomic website, that allows you to locate the property presented on a Port Grimaud map and refine your search according to the type of property chosen (house or apartment with or without mooring), the price, the size, the number of rooms and the size of the mooring. A very detailed blog in French and English on the history of Port Grimaud, the events and entertainments organized for you in Grimaud and Port Grimaud, as well as the activities to which you can devote yourself during your stay in the lakeside city. A quarterly magazine, the Boutemy Mag, distributed in the town's streets and read with enthusiasm by its visitors. It ensures tremendous publicity for the properties highlighted in it. 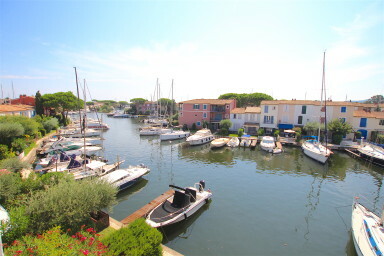 You'll also find interviews with residents of Port Grimaud or people active in the town management. All these initiatives make the agency a trusted partner in the realization of your real estate project. A strong sign of this trust is the large number of properties exclusively entrusted to the Boutemy Immobilier agency. We hope to have the pleasure of working with you soon and suggest you check out all our properties for sale on the website.